The wait is over  introducing the aluminum "Ripper" mountain frame from Slingshot. "After tremendous urging from our customers to develop some aluminum bikes, we are excited to launch the Ripper for public purchase," said Slingshot President, Scott Templar. The main criteria used in the development of the frame, was to design the ultimate x-country race machine. At the heart of the Ripper remains the famous SPT (Sling Power Technology)  an energy returning system which utilizes a composite flex board, stainless cable down tube and spring to provide the rider with un-matched performance and comfort. New to the Ripper, is a field fixable flex board. Shaped like a "dogbone" the board is easily installed without the use of glue (as on older models) allowing the owner to self-service the bike if board replacement is required. This process used to require the owner to ship the bike back to Slingshot for service. The front "Boomtube" or top tube; is a new, oversized custom design which is engineered to optimize performance while remaining lightweight. The rear end of the Ripper is also custom. The extruded, oversized seat tube provides tremendous stiffness to the rider while highlighting the SPT benefits. Using 7005 aluminum, Slingshot has found the ultimate amount of frame rigidity, allowing the rider the greatest amount of SPT benefit. Introduced at the Xterra Iceman Mountain Bike Race in November, 2005  the Ripper received tremendous racer approval at the event expo, and made an instant impact in the race. The first Michigan Pro Male finisher (Russ Tiles) and Women (Jessica Woodard) were aboard a Ripper, along with the Men and Women Pro Single Speed winners (Niel Sharpehorn and Danielle Musto). The Slingshot Ripper frame is priced at $1,400, and is currently in stock and ready to ship. Ripper frames come in 14", 16", 18", and 20" sizes. 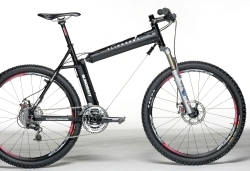 Based in Grand Rapids, Michigan, Slingshot has been a leader in bicycle suspension systems since 1982. The patented SPT: Sling Power Technology, provides the rider with unparalleled energy storing performance. Slingshot is also a leader in high-performance folding bikes with its patented Fold-Tech line. For information on the Slingshot brand and their latest products visit www.slingshotbikes.com.